There is a lot to getting started online as an affiliate marketer or any other online activity. It can all be overwhelming. Affiliate marketing does do away with some of the barriers like coming up with a product(s) and then dealing with customers. It is relatively low cost. But there is still a lot to do and understand. On top of that you get lots of conflicting advice on what to do – as some even say it’s not the way to go or you need a list you don’t need a list, you need a website you don’t need a website and on and on. You can end up feeling trapped because of it all – stuck in a ball of confusion not knowing which way to turn. Or you start something and you can’t get it to work so just have a deep pit of despair in your stomach especially if you spent a small fortune on the course. It can feel paralyzing. There is the fear you are just wasting your time and money. So instead of getting started you might buy another product that has the real secret. Not everyone is going to get started by hitting a home run, but it is by doing that you slowly learn what’s what and start to see money. If you are trying to create value and keep at it. Your first attempt might not make money but your next one might or the next one. It does start by being prepared to make mistakes as a way of moving “forward by failing” and learning specific skills so you can get better at them rather than trying to learn everything at once. You don’t have to spend all of your time and money trying to figure out all the intricacies of Google to get found to earn an income from affiliate marketing and you don’t even have to have an email list (although it can help in some niches). You might now be thinking not yet more courses, after what you said before. 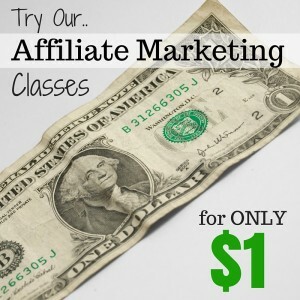 The 3 I’m going to suggest are ones that I’ve been through and 2 of them got me started on building affiliate marketing businesses. I went through these struggles and it wasn’t until I implemented the first 2 that I actually began to make progress – it was small at first – still is to a certain extent, but it is moving forward now. They are by people that stand behind their products and provide good support and value. I’ve reviewed them on the blog here. They can get you started the right way. There is enough support in them that you have a higher chance of creating something value that earns some sustainable income than many of the other courses out there. And they don’t cost a fortune. They all take you from getting your website through to setting up your blog with content and getting traffic etc. It is all step by step. This is the course, well its 2 related courses really that I’ve had the most success with, I’ve also worked on implementing it for 2 years or so now and recently had some relatively good results for me. It is based on being an Amazon affiliate and writing in depth reviews on physical products. You can find out more about in my review here. This is the one I’ve been through but not implemented although I’m using some of what I learned to improve my Extreme Review. It has a very active Facebook group that you can ask questions and the creators of the course are adding new content to help you regularly. (Blog Set Up part of course released next week) You can see my review of it here. So, do you have this fear or something else holding you back from starting or holding you back from your affiliate marketing and won’t be helped with one of my suggested courses. Maybe you have a tip or idea you want to share that will help others. Let us know about it below. And don’t forget to sign up to my affiliate marketing tips list below.